Greetings to All Fuse Members! 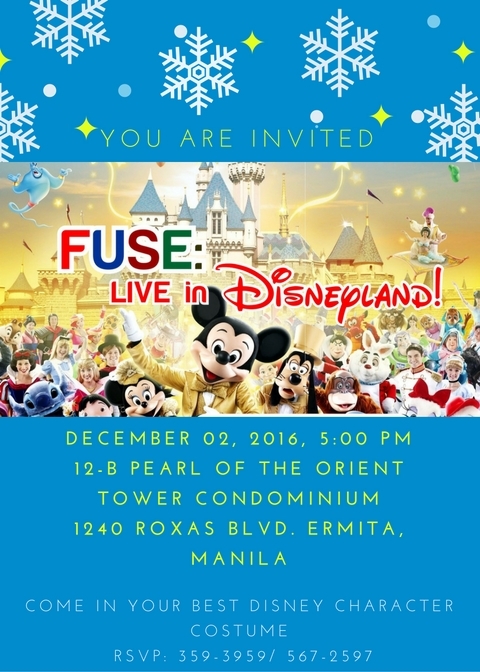 It is our honor to invite you to our Christmas Party at the 12-B Pearl of the Orient Tower Condominium, 1240 Roxas Blvd. Ermita, Manila on December 02, 2016 at 5:00 p.m. It is Christmas time once again and we can not let this season pass without seeing you. You have been very special to us and we have prepared a couple of activities that for sure each of us will enjoy. We will also have our exchange gift worth 300. It is our wish that you will be able to find time for this said party. Please be in your favorite Disney character costume, just make yourself ready to play the games that we have prepared.